First the Question: The Body of Christ is NOT Israel. True or False? Question: Can a Christian be active in the work of God, but grow very little, because they are not regularly studying the Bible? Yes or No? Some young Christians, as well as old ones, are unceasingly active, but growing very little, because they are not regularly and systematically studying the Word of God. One of the signs of a healthy Christian is a real appetite for the Word of God, an appetite satisfied by constantly feeding upon that Word. Jeremiah said, “Thy Words were found, and I did eat them, and Thy Word was unto me the joy and the rejoicing of my heart.” Jeremiah 15:16. 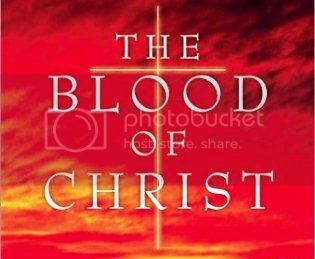 Let me just say at this point, that there are pastors, preachers, and teachers, that do not believe that it was the Blood of Christ, the actual shedding of that Blood on the cross of Calvary that saves us. The first PRECIOUS PROMISE in the Bible is the promise that the Seed of the woman would bruise the serpent’s head. (Genesis 3:14-15). That meant the death and the resurrection of the Seed of the woman. He is now alive in heaven and will come to earth again. So many events have already taken place, in fulfillment of this PRECIOUS PROMISE, and many more are yet to be fulfilled. When Christ was in the shadow of the cross He said, “Now is the prince of this world cast out.” (John 12:30-32). We read what the Holy Spirit said through the Apostle Paul, when he wrote, “And the God of peace shall bruise Satan under your feet shortly” (Romans 16:20). Satan is having a good time now, but we read in 1 John 3:8 that the Son of God was manifested that He might destroy the works of the devil. We certainly see the works of the devil all over this earth and he is also active as the head of spiritual wickedness in the heavenlies (Ephesians 6:11-14). But, now, read Christ’s victory over Satan in Luke 4:1-9. And then read of Satan in the bottomless pit (Revelation 20:1-3). The Lake of Fire has been prepared for the devil and his angels. (Matthew 25:41; Revelation 20:10). However, the devil, now, like a roaring lion, is walking about, seeking whom he may devour (1 Peter 5:8-9). But he has a very special deadly work to do on this earth after the Body of Christ goes home to glory. (Revelation 12:10-12). Then, after one thousand years in the bottomless pit, he will reach his final abode (Revelation 20:1-10). Make a special note as to what Christ had to do in order to destroy Satan’s “death” power, “Forasmuch then as the children are partakers of flesh and blood. He also Himself took part of the same; that through death He might destroy him that had the power of death, that is, the devil.” (Hebrews 2:14). That meant that Christ had to shed His PRECIOUS BLOOD. (1 Peter 1:18-20). Christ was God’s own ELECT PRECIOUS CHIEF CORNERSTONE. (1 Peter 2:6). Chosen of God and PRECIOUS.” (1 Peter 2:4). In addition to His Divine nature Christ took upon Himself human nature (John 1:14; Philippians 2:5-8; Hebrews 2:14) that believers might be partakers of His Divine nature in addition to their human nature and be delivered from the fear of death, and ultimately from death of any kind. This Faith in God’s PRECIOUS PROMISES and HIS PRECIOUS STONE and the PRECIOUS SHED BLOOD OF CHRIST is called “PRECIOUS FAITH.” (1 Peter 1:7). Is it any wonder that God says “PRECIOUS in the sight of the LORD is the death of His saints?” (Psalms 116:15). The Lord Jesus Christ, Who is God’s Elect, PRECIOUS STONE, and Who is PRECIOUS to believers, is the STONE of stumbling and ROCK of offence to the unbeliever. Note in the last five verses of the ninth chapter of Romans how Christ was the STUMBLING STONE for blind Israelites. With these five verses read 1 Peter 2:2-11. First the Question: Can a Christian be active in the work of God, but grow very little, because they are not regularly studying the Bible? Yes or No? The Lion and Lamb Ministry (LLM), is an online organization and home for members of the Body of Christ for the training and promotion of the Children of God as Ambassadors for Christ in the Ministry of Reconciliation (2 Cor. 5:18-20). At the LLM website, in obedience to Ephesians 3:2-11, you will learn and be instructed in, particularly but not exclusively, The Mystery of the Body of Christ, The Dispensation of the Mystery, The Dispensation of Grace, and serious study of The Bible as the inerrant Word of God. 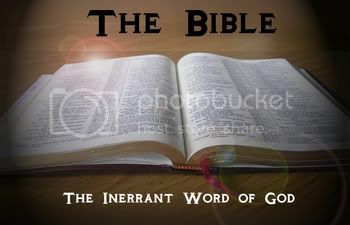 LLM Question for 6-25-2012, and, Is The Bible the INERRANT Word of God? Question: Is The Bible the INERRANT Word of God? Yes or No? The Bible is peculiarly the Book of God. It is the revelation of God to the human race. We must learn to view the The Bible as a message system. It's not simply 66 books penned by 40 authors over thousands of years, which, you have to admit, is a miracle unto itself! However, the Bible is an integrated whole; which bears the evidence of supernatural engineering in every detail! The first Book is called Genesis. Genesis is the Book of beginnings. The first five Books of the Bible are called the “Pentateuch.” “Pente” means “five.” Some Jews refer to these five Books as “the Books of Moses.” The five Books are Genesis, Exodus, Leviticus, Numbers, and Deuteronomy. Moses was born in Egypt. Moses was a descendant of Levi, who was one of the sons of Jacob, or Israel. Moses was the man whom God chose to write the first Books of the Bible. The last Book of the Bible is called “The Revelation”, “The Revelation of Jesus Christ.” The Greek word translated “Revela­tion” is “Apokalupsis.” This word means “the unveiling”, (and NOT “The End”, as many believe). The human author, whom God used to write “The Revelation of Jesus Christ”, the last Book of the Bible, was the Apostle John. Then He saw James and John with their father. They were in their fishing boat mending their nets. Matthew 4:21. The Lord said, “Follow Me and I will make you fishers of men.” Peter and John became partners in the business of fishing for men. They labored together in the service of the Lord, witnessing concerning His life and works and ministry, His death and resurrection. Luke 22:8, Acts 3:1-3, Acts 3:11, Acts 4:13, Acts 4:19, and Acts 8:14. The Apostle John was about 100 years of age when he died. He died about 100 A. D. (Anno Domini), “the year of the Lord.” The last Book of the Bible was written between 1500 and 1600 years AFTER the first Book of the Bible was written. “Come now therefore and I will send thee unto Pharaoh, that thou mayest bring forth my people, the children of Israel, out of Egypt” Exodus 3:10. “And God said unto Moses, I AM THAT I AM: and He said, Thus shalt thou say unto the children of Israel, I AM hath sent me unto you.” Exodus 3:14. Other shepherds who wrote Books in the Bible were David and Amos. Thus we see that the first Book of the Bible was written by a shepherd and the last Book by a fisherman. We have learned that Simon Peter, his brother Andrew, James, and John, were four of the twelve apostles whom Jesus Christ, while on earth, selected from His many disciples. Of His twelve apostles, John wrote five of the Books of the Bible, Peter wrote two of the Books, Levi (Matthew) wrote one. Matthew wrote the first Book after the death of Christ; it is called “Matthew”. It is generally believed that James, who wrote the Epistle of James, was one of the twelve apostles. This James is thought to be the James called “the Lord’s brother”. Galatians 1:19. He was not the brother of John. John’s brother, James, was killed by Herod about 45 A. D. Acts 12:1-2, “Now about that time Herod the king stretched forth his hands to vex certain of the church. And he killed James the brother of John, with the sword.” So we learn that Christ had two apostles by the name of James. Then the sixty fifth Book of the Bible, one of the shortest Books in the Bible (one chapter of 25 verses) was written by Jude. It bears his name. It is generally believed that he was one of the twelve apostles. We have mentioned six of the twelve apostles, Simon Peter, John, James, Andrew, Jude, and James. It is thought that Jude was also called “Thaddaeus”. Matthew 10:3. ADAM AND CHRIST - B. C. and A. D.
We have explained that B. C. means “before (Jesus) Christ”, that is, before He was born of Mary in Bethlehem. A. D. means years since that great event took place. Dating back B. C. from the birth of Christ to the creation of Adam there were about 4000 years of the history of the human race. If we date from the birth of Adam, we call the year “A. H.”, Anno Homini. This means, “the year of man”. Some people speak of A. M., “Anno Mundi”. This means, “the year of the world.” We can be quite accurate in fixing the date of the making of the first man and his wife, Adam and Eve. They were in the Garden of Eden about 4000 years “Before Christ”. Therefore Christ was born about 4000 Anno Homini, “the year of man”. Note that about 4000 years elapsed between the time the first man was in the Garden of Eden and the time that the little Child Jesus was in the manger at Bethlehem. The Lord Jesus Christ is mentioned in the 27 Books, from Matthew to Revelation, by noun and pronoun, more than 6900 times. The very heart of the Bible is the fact that the Lord Jesus Christ, Who was in the Godhead in creation, came down from Heaven to die for sin; that is, He appeared ONCE in the end of the ages to put away sin by the ONCE sacrifice of Himself. Hebrews 9:26. But note the fact also of His resurrection and ascension; for He went back to heaven where He now lives at God’s right hand, “This Man, after He had offered one sacrifice for sins forever, sat down on the right hand of God.” Hebrews 10:12. This was all in fulfillment of God’s infallible Scriptures, according to God’s infallible Word. The Bible, God’s message system, in reflecting its supernatural origin, tells us, and explains to us that God’s free gift is eternal life through Jesus Christ our Lord. Romans 6:23. 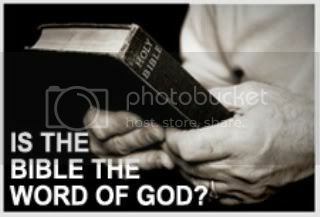 LLM Question for 6-23-2012, and, Is The Bible REALLY the Inspired Word of God? First the Question: Is The Bible the INERRANT Word of God? Yes or No? Question: Is The Bible Really the Inspired Word of God? Yes or No? Is The Bible REALLY the Inspired Word of God? Now, we are more sophisticated (we think!) and have become “judges” and “critics” of the Bible. Its historicity and accuracy is being challenged by many people, both secularists as well as religious people. We continue to question the authenticity of the Bible and the majority of Americans doubt that the Bible IS THE Word of God and that it is inspired of God. SO, WHAT DO WE MEAN BY “INSPIRATION”? Inspiration does NOT refer to the writers, but rather to the writings. 2 Timothy 3:16 says “All Scripture is given by inspiration of God.” 2 Peter 1:20-21 insists that the writers were controlled by the Holy Spirit so that what was written was accurate and exactly what God wanted to communicate to us. The Bible is not only “inspired of God” - it is also inerrant (without error in the original autographs). It is the most translated and distributed book before the invention of printing (1450 AD) in the history of the world! No other writing is close to its manuscript evidence. Over 5500 Greek manuscripts, 10,000 Latin manuscripts, and over 1000 manuscripts in other languages - all before the invention of printing! Incredible to say the least! Inspiration refers to ALL that was written - not just parts of it. If you can’t trust the Bible’s historical facts, then how can you trust its moral and spiritual teachings? The Bible is the most amazing book of all history - actually it is a library (like an integrated software system!) of 66 books. The Old Testament has 39 books in the Protestant Bible (exactly the same as the Jewish Bible, the Tanakh, but organized differently in three major sections - the torah, the prophets, and the writings.) The New Testament contains 27 books. The ROMAN Catholic Bible has added some 14 Jewish apocryphal books, but the early church NEVER considered them inspired of God even though some of them do contain valuable history. There have been some modern attempts (Gospel of Thomas, Gospel of Judas, etc.) to add books to the Bible as though they were on the level of the authorized canon of the Scriptures - but it won’t work! These “pseudo-graphic” writings clearly reveal that they are outside the realm of Biblical authority and authenticity. But, how do we know that the Bible is a FINAL and COMPLETE revelation of God in written form? That's our NEXT message. Stay tuned! 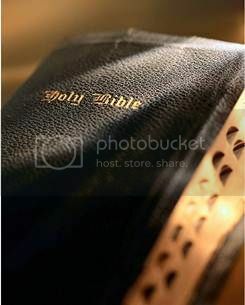 LLM Question for 6-21-2012, and, The Bible, Which Version? First the Question: Is The Bible Really the Inspired Word of God? Yes or No? Question: Does the Codex Vaticanus, used by modern versions of the Bible, such as the NIV, end at Hebrews 9:14, and exclude the the Apostle Paul's Pastoral Epistles and The Book of Revelation? Yes or No? This is a difficult issue to address in one message, but because of the continual questions we receive on this matter, we have put together an explanation of the evidence behind the Bible. Now, we are not saying that the King James Bible is the ONLY English Bible that should be used. We are in favor of “updating” the English of the King James whenever possible AS LONG AS the manuscript evidence is not altered or ignored. We do not possess any so-called “original autographs,” but the manuscript evidence that we DO have is greater than any other piece of literature in the history before the invention of the printing press. May the LORD use these simple facts to guide us all in getting the Word of God into the language of the people of this world! Our focus will be on the New Testament where most of the arguments come. It was originally given to us in the Greek language, the largest language in the history of the world! The first edition of the Greek text to be published was that of Desiderius Erasmus in 1516 AD, followed by his edition in 1519 AND WHICH WAS USED BY MARTIN LUTHER for his German translation of the Bible. Erasmus also published editions in 1522, 1527, and 1535 AD, the last two of which contained some changes from the Complutensian Polyglot printed in 1514 AD, but not circulated until 1522 AD. This Complutensian Greek text was reprinted with only a few changes in 1571, 1572, 1573, 1574, 1583, 1584 AD, and in Geneva, editions were put out from 1609 to 1628 AD. Simon Colinaeus, a printer in Paris, published an edition of the Greek text in 1534 AD based upon those of Erasmus and the Complutensian Greek NT. It was superseded by the famous editions of his stepson, Robert Stephens, who printed editions in 1546, 1549, and 1550 AD, the last one known as the “royal edition.” This was the primary Greek text used by the King James translators, along with additions by Theodore Beza, especially the one of 1598 AD. The Elzevir partners, Bonaventure and Abraham, published editions of the Greek text in 1624, 1633, and 1641, following primarily the 1565 edition by Theodore Beza. The preface to the 1633 edition gave the name to this historical tradition of manuscript evidence and called in “Textus Receptus.” In the course of time, it was applied to the Stephens text of 1550 AD and those which followed. The primary edition behind this Greek text is that of F.H.A. Scrivener that was published by Cambridge University Press in 1894 and 1902 AD. About two thirds of the NT Greek text was discovered in the 20th century AD. And these manuscripts that were discovered in the 20th century A.D. actually PRECEDED 300 AD, AND the famous Codex Sinaiticus and Codex Vaticanus, and Codex Alexandrinus. This is very important! Codex Vaticanus differs greatly from the Textus Receptus throughout the New Testament. The great Greek scholar Dean Burgon published in 1881 that in the gospels alone, Codex Vaticanus omits 2877 words, adds 536, substitutes 935, transposes 2098, and modifies 1132 – making 7578 total changes! Codex Sinaiticus has 8972 changes from the Textus Receptus. Now, pay attention here, the POPULAR Greek texts of TODAY are dependent upon TWO “ECUMENICAL” institutes in Germany. That’s right! RIDICULOUS! 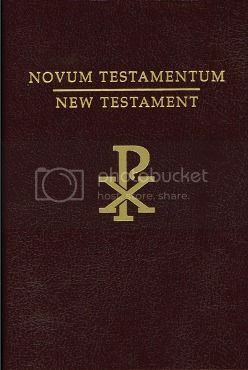 So now let us consider the following: the 26th edition of the Nestle Greek text was done, according to Kurt Aland, “in cooperation with the appropriate agencies of the Roman Catholic Church.” Codex Vaticanus is the Greek text used by the Emphatic Diaglot which is behind the Watchtower Bible of the Jehovah Witnesses. Codex Vaticanus ends at Hebrews 9:14! And then excludes the Pastoral Epistles and the book of Revelation. It contains all 14 Apocryphal books, and worst of all contains 7579 changes from the Textus Receptus. Codex Sinaiticus has one half of its NT leaves missing! And then contains the Epistle of Barnabas and the Shepherd of Hermes. It has 9000 changes from the Textus Receptus. Tischendorf, the one who found Codex Sinaiticus, made 3369 changes in his 8th edition from his 7th edition. So, let’s review, what this means is that these two MSS make over 30,000 changes. The King James Bible was translated by 54 men who labored from 1607 to 1610 AD. They spent hours in prayer and insisted on unanimous decisions on the readings of the text. It was indeed a remarkable effort and has been the Bible of the English speaking world for over 400 years. However, after all this, the most important thing to consider is that this generation needs to return to the reading and study of the Bible itself, the Textus Receptus, The AKJV! May our pastors, preachers, and teachers, re-emphasize the importance of the Bible in everything we say and do! LLM Question for 6-19-2012, and, Is the Order of God Today to the Jew First? First the Question: Does the Codex Vaticanus, used by modern versions of the Bible, such as the NIV, end at Hebrews 9:14, and exclude the the Apostle Paul's Pastoral Epistles and The Book of Revelation? Yes or No? Question: Is the order of God, for today, to the Jew first? Yes or No? Is the Order of God Today to the Jew First? “To the Jew first, and also to the Greek.” (Romans 1:16). In Mark 7:24-30 we learn that the Jew was more than first, and the poor Greek had a difficult time getting in at all. The twelve apostles asked the LORD Jesus to send her away without a blessing (Matthew 15:23). Then Christ said, “I am not sent but unto Israel.” (Matthew 15:24). Christ said to that Greek woman this significant thing, “let the children (the Jews) FIRST BE FILLED.” “It is not meet to take the children’s bread and cast it to dogs.” (Mark 7:27). Let us keep in mind that Christ “came unto His own.” (John 1:11). Christ was born to be Israel’s Saviour (Acts 13:23). Christ, (the Stone) had to be rejected by Israel, the Builders, (Matthew 21:42), before the salvation of Romans 11:11 would be sent to Gentiles to provoke Israel to jealousy. One of the most important keys to the truth concerning Gentiles salvation by Grace is the truth of Acts 5:29-32; that Christ was raised up TWICE to be Israel’s Savior, first in incarnation, and second in resurrection. This same truth is stated in Acts 13:23 and Acts 13:30-36. Christ said that His own, “the children of the kingdom,” would be cast into outer darkness. (Matthew 8:12). After that He wept as He pled with them. (Luke 13:34-35). But as we turn from this sorrowful message of Christ in Luke 13:34-35 to Matthew 23:30-39, we turn from compassionate love and indignation to awful wrath and indignation; for, in Matthew, the children of the kingdom who were to be filled FIRST, were called serpents and a generation of vipers. (Matthew 23:33). This seems to be worse than the Gentiles. The Gentiles were dogs. The Jews were “serpents” and “vipers,” far worse than dogs. They were to have something worse than the darkness of Matthew 8:12; even the damnation of hell. (Matthew 23:33). But as we think of Mark 7:26-27 and Matthew 23:33, the “serpents” and the “dogs”, let us also think of what the Apostle Paul said, years later, “to the Jews (the serpents) first and also to the Greeks (the dogs).” (Romans 1:16). “Unto you FIRST God, having raised up His Son Jesus, sent Him to bless you, in turning away every one of you from his iniquities.” (Acts 3:26). Remember “the children FIRST be filled.” (Mark 7:27). “Then Paul and Barnabas waxed bold, and said, It was necessary that the Word of God should FIRST have been spoken to you (Jews): but seeing ye put it from you, and judge yourselves unworthy of everlasting life, lo, we turn to the Gentiles.” (Acts 13:46). In reading Acts 3:26 also read Acts 3:25 and note that the Jews had suddenly become “children” again. Compare the denunciation, condemnation and wrath of Matthew 23:30-39, with the tenderness and mercy of Acts 3:12-18. What changed the “serpents” back to “children”? The prayer of Christ on the cross (Luke 23:34); and the truth of Acts 3:17-18. Then Israel was again FIRST. The Jews continued to be FIRST until something happened to them. The wrath of God fell again and God blinded Israel; after which Israel was to obtain mercy from God through the Gentiles. (Romans 11:31). The wrath of God came unto the uttermost. (1 Thessalonians 2:14-16). 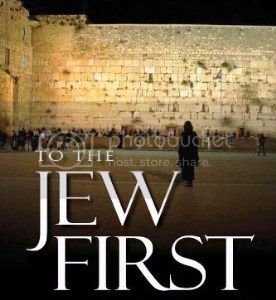 Then God’s order ceased to be “TO THE JEWS FIRST.” God expects His children to be wise enough to know that His order would not be “TO THE JEWS FIRST” after what God did to the Jews, according to Romans 11:7-11 and Romans 11:25. First the Question: Is the order of God, for today, to the Jew first? Yes or No? 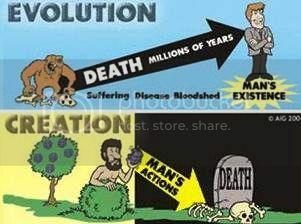 Question: Does the theory of evolution, which states that man is and has been ascending, explain why the world is in worse condition and misery now than ever before? Yes or No? First the Question: Does the theory of evolution, which states that man is and has been ascending, explain why the world is in worse condition and misery now than ever before? Yes or No? Question: Christ, in heaven, is the only priest that any believer needs. True or False? SO, WHEN WAS PETER IN ROME? It does seem that the Roman Catholic Church would try to prove their claims to priority rights by quoting from the LETTER OF PAUL that was written to the first Christians in Rome; but that LETTER is God’s answer to the fanciful claims and false doctrines taught by the Roman Catholic Church. In Romans 16, the Apostle Paul sent greetings to more than 25 saints whom he mentioned by name and to others not mentioned by name. Paul’s LETTER to the Roman Christians was written about two years BEFORE he reached Rome. But NOTICE, the Apostle Peter’s name was not mentioned by Paul among those to whom he sent his love. His name would not have been omitted, IF Peter were there. By comparison, just imagine anyone in the Roman Catholic Church Organization today with as high a standing in that church as the Apostle Paul had in the true Bible Church sending love to every saint or Christian in Rome EXCEPT the Pope. Remember Paul’s words in Romans 1:7-15. He wanted to preach the gospel in Rome and establish the saints. Read those verses. Paul wanted fruit among the Gentiles, or heathen, in Rome. (Romans 1:13). Peter agreed to go to Jews. (Galatians 2:9). Now remember, the Apostle Paul’s rule was NOT to preach where Christ had been named; NOT to build on another man’s foundation. (Romans 15:20-21). You got that? Perhaps, some things the Holy Spirit wrote through Paul in Paul’s Epistles written from Rome AFTER he reached Rome (Philemon, Philippians, 1 Timothy, Ephesians, Colossians, and 2 Timothy), called Paul’s ‘PRISON’ Epistles, were more difficult to understand than the Epistle to the Romans. The Apostle Peter acknowledged that some things in the Apostle Paul’s Writings were hard to be understood. But, acknowledge them he did! (2 Peter 3:14-16). In Paul’s ‘PRISON’ Epistles, written during the five to seven years that he was in Rome, he mentioned different saints who were in Rome. If Peter had been there from 62 A.D. to 68 A.D. and were really a pope, do you think Paul would have failed to mention Peter’s name, in all of those Epistles? Members of the Body of Christ, Students of God’s Word, the Bereans, searched the Scriptures daily to see whether the things spoken by the preachers are true. (Acts 17:11). All Christians should be Bereans today. The celebration of the Roman Catholic mass, all the way from the prayers at the foot of the altar to the elevating of the host and chalice, as taught by the Roman Catholic Church, is not even hinted at in the Roman Catholic Bible any more than is the teaching that unbaptized infants go to limbo, or that even those who are Roman Catholic communicants must complete expiation in purgatory for either venal or mortal sins, or that the sprinkling of holy water takes away original sin or makes the baptized person a Christian. The Bill of Rights, still, grants to every individual in this country, The United States of America, the freedom of worship and in that sense every Roman Catholic, evangelical Christian, Jew, or atheist, has the legal, constitutional right to his religious belief or unbelief. HOWEVER, no religious individual, group, or organization, who claims to propagate Bible Christianity, should substitute man made rules, laws, ceremonies, doctrines, and religious programs, for Bible doctrines and programs and call the substitution ‘Bible Christianity’. THAT is ridiculous! Christ called Himself the ‘STONE’. (Matthew 21:42). Christ called Himself the “VINE”. (John 15:1). Christ called Himself the ‘DOOR’. (John 10:9). Christ called Himself ‘BREAD’. (John 6:48-51). Was Christ literally a ‘STONE’ or a ‘VINE’ or a ‘DOOR’ or ‘BREAD’? Don’t be STUPID! Every believer, saved by Grace through the Faith in the eternal Christ, is a partaker of Christ (Hebrews 3:14), a partaker of His Divine nature (2 Peter 1:4), a partaker of Christ’s sufferings (1 Peter 4:13), a partaker of the Holy Spirit (Hebrews 6:4), a partaker of Christ’s Holiness (Hebrews 12:10) and a partaker of His glory. (1 Peter 5:1). In the Roman Catholic Bible more than seventy times the believer is said to be ‘IN CHRIST’. Christ is in the believer. (Galatians 2:20 and Colossians 1:27). If Christ is not in the individual, that individual is a reprobate. (2 Cor. 13:5). CHRIST IN THE BELIEVER is the believer’s Hope of Glory. (Colossians 1:27). A wafer or a religious mixture in a cup, blessed by priests, although “Jesus, The Savior of Men” (I.H.S.) may appear on the chalice, is no hope for any poor sinner whether he be called Roman Catholic or Protestant. Every Christian is supposed to be ready to give an answer to those who ask for the reason of his hope within. (1 Peter 3:15). The Roman Catholic may say that his hope of purgatory is Jesus in the cup. Surely the Christian taught the truth by the Holy Spirit knows that he has a much better hope, ‘THE HOPE OF GLORY’, Christ dwelling IN him. What a difference! No matter what the priests or his religious church superiors may do to the wafer and wine, after all their religious manipulations they still have bread and wine and not flesh and blood. When Christ spoke of the bread and wine as His body and blood, He was using the elements as symbols, just as the Paschal lamb spoke of the Son of God, as the Lamb of God dying on the cross. The LORD Jesus Christ on the cross was not actually a LAMB, but a Divine human being. He cried on the cross ‘FINISHED’. (John 19:30-31). By His death Christ brought an END to the carnal ordinances, divers baptisms, and meats and drinks, of Hebrews 9:10. (Colossians 2:13-16). “Let no man judge you” in these things. (Colossians 2:16). The religious program imposed upon Israel was the SHADOW of things to come, but the Body is Christ. (Colossians 2:17). (Hebrews 10:1-10). Christ’s death brought the END of the Law, with its ceremonies, the end of a special order of religious priests. Calvary is the only altar any sinner needs and Christ in heaven is the only priest that any believer needs. (Hebrews 9:24). (1 John 2:1-2). (1 John 1:7-9). It is quite evident that very few Roman Catholics are going to be noble Bereans and search the Roman Catholic Bible daily to see whether their leaders are teaching them the truth as it is in God’s Word. (Acts 17:11). If their church leaders are blind, they seem to be willing to be blind followers of the blind. HOWEVER, they are certainly NOT being aroused or enlightened by the great majority of so called evangelical Christians, who are in a state of utter apathy, many not even PROTESTING against the Modernists in THEIR midst, who are propagating their “christianized” agnosticism in the name of Christ, using Christian phraseology and Bible terminology, just as they are described in 2 Cor. 11:13-15, under the power of Satan as an angel of light. Sickening! 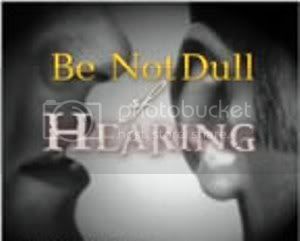 HOWEVER, to be sure, while Satan is rejoicing in his success in blinding the minds of millions (2 Cor. 4:3-4) and tossing Christians to and fro with every wind of doctrine (Ephesians 4:14), the Holy Spirit is holding together civilization until God completes ‘THE ONE NEW MAN of Ephesians 2:15, ‘THE BODY OF CHRIST’, ‘THE CHURCH OF GOD WHICH HE PURCHASED WITH HIS OWN BLOOD’ (Acts 20:28). Then will come the great moment of 1 Corinthians 15:51-52 and Titus 2:13; and then that glorious PRESENTATION of Ephesians 5:27. How blessed it is to have a real honest to goodness, ‘I know so’ salvation in such a world as we see around us today; to have a head AND heart knowledge of the Grace of God that hath appeared to all men, bringing salvation, and teaching Christians to deny ungodliness and worldly lusts, and live soberly, righteously and godly in this present world, looking for that blessed hope, the glorious appearing of the Great God, our Savior Jesus Christ, Who gave Himself for us, that He might redeem us from all iniquity and purify unto Himself a peculiar people zealous of good works. (Titus 2:11-14). First the Question: Christ, in heaven, is the only priest that any believer needs. True or False? Question: The Apostle Peter had absolutely NO apostolic authority over the Apostle Paul. True or False? How did the Apostle Peter REMIT SINS? When Peter and Cornelius with his company met, surely Peter did not hold out a ringed finger for Cornelius to kiss, but said to Cornelius, “stand up, for I also am a man:” (Acts 10:26). As we said, so far as we have any record in any Bible, Cornelius and his company were the only Gentiles to whom Peter ministered. Of course, we do not say that he did not preach to others, but we do state that it is significant that no others are mentioned by name, that he did agree to go to the Jews (Galatians 2:9). However, the Apostle Paul mentioned many Gentiles. But note how Peter remitted their sins, and you will know that any twelve year old saved Christian can today remit the sins of any sinner in the same manner. Read Acts 10:39-40, that Christ was nailed to the tree and raised from the dead, and then Peter added, “To Him give all the prophets witness, that through HIS NAME (THE LORD JESUS CHRIST) whosoever believeth in HIM shall receive remission of sins!” (Acts 10:43).And there it is! There is NO priest or pope here forgiving sins, or mass, or beads, or holy water, or confessional or penance, except as God granted to Cornelius repentance unto life (Acts 11:18). Cornelius and his company received the Holy Spirit and salvation BEFORE they received water baptism. (Acts 10:44-48). I do not see any water christening here to take away original sin. Do you? We have the one and only case of APOSTOLIC SUCCESSION mentioned in the Roman Catholic Bible in Acts 1:20, “his bishopric let another take.” Then after the casting of lots for the successor of Judas, Matthias was numbered with the eleven apostles. (Acts 1:26). TWELVE apostles stood up on the day of Pentecost. (Acts 2:14) God did not permit the number ‘TWELVE’ to be reduced to ‘ELEVEN’ (by the death of James in Acts 12:1-2) until Peter had used the KEYS OF THE KINGDOM to the House of Israel and the House of Cornelius. ‘TWELVE’ is the number of God’s ‘KINGDOM’ nation, ‘ISRAEL’. ‘ONE’, the number used by the Apostle Paul, to whom the RISEN Christ revealed the hope and calling of members of the Church which is Christ’s Body, is the number of that Church, in Grace. This number ‘ONE’ is mentioned by the Holy Spirit in Paul’s Writings more than twenty times. It was through Paul that the LORD made known that He would not make the NEW ISRAEL of Isaiah 62:1-5 until He had completed and glorified ‘THE ONE NEW MAN’ of Ephesians 2:15. (Romans 11:25-26). Isn’t that MARVELOUS! Praise the LORD! With the death of James, one of the ‘TWELVE’, the LORD was ready for the Apostle Paul to go forth, independent of the ‘TWELVE’, with the LORD’s new program. (Acts 13:2). God was getting ready to cast away Israel, temporarily, (Romans 11:15) and inaugurate ‘THE DISPENSATION OF THE GRACE OF GOD’ (Ephesians 3:1-3) through ‘THE APOSTLE OF THE GENTILES’, who declared that a ‘DISPENSATION’ was committed to him. (1 Corinthians 9:17; Colossians 1:24-26). Therefore, no successor was required by the LORD to take the place of the second apostle of the ‘TWELVE’ to die, as in the case of the first (Judas). There is a hint at apostolic succession in Paul’s farewell words to Timothy when Paul wrote Timothy to pass on, his (Paul’s) teachings to others, who in turn were to perpet­uate ‘the deposit’ committed to Paul. (Break out your Lexicons and see the Greek of 2 Timothy 1:12). Read carefully Paul’s words to Timothy in 2 Timothy 2:1-9. The Roman Catholics have made the great blunder that so many evangelical Christians have made. That is IGNORING the Apostle Paul’s instructions to Timothy, and failing to obey Ephesians 3:9, making God’s saints to see what is ‘THE DISPENSATION OF THE MYSTERY’. They have utterly confused the Apostle Peter’s Kingdom Keys, and Kingdom message, the building of the TABERNACLE OF DAVID, Peter’s message to the God fearing, devout, Jew loving, seeking, Cornelius, with GOD’S NEW DEAL for the human race in 2 Cor. 5:16-21; Romans 11:15; Ephesians 2:15, Paul’s Christ given ‘DISPENSATION’ and the new program of Ephesians 4:7-14, THE BUILDING UP OF THE BODY; THE PERFECT MAN. Therefore, they have been numbered with the religious church members mentioned in Ephesians 4:14, “gone with the wind.” They are described as babes in Hebrews 5:11-14, and have NOT gone on to perfection. (Hebrews 6:1; Ephesians 4:12; 1 Corinthians 13:8-11). Christians, who build intelligently with God in this current Dispensation of Grace, must give heed to 1 Corinthians 3:10, and go to the Apostle Paul, rather than to the Apostle Peter, for God’s blueprints and specifications, not fixing the open ‘Faith’ door for Gentiles of Acts 14:27 at Israel’s Pentecost of Acts 2, BUT RATHER after the apostles were reduced from TWELVE to ELEVEN. Someone has said, if, in Galatians 2:1-14, Peter was a Roman Catholic, Paul surely was a Protestant. Peter had absolutely NO apostolic authority over Paul. Peter added nothing to Paul; but CONTRARIWISE, (Galatians 2:6-7). The LORD’s ‘Grace’ message by the Apostle Paul was, “By Grace are ye saved through faith, and that not of yourselves; not of works.” (Ephesians 2:8-9). “Not by works of righteousness which we have done.” (Titus 3:5-8). All who were thus saved by Grace, baptized into the one true BIBLE CHURCH, made a part of the ONE NEW MAN of Ephesians 2:15, added by the LORD to the CHURCH, were God’s workmanship, created in Christ Jesus unto good works. (Ephesians 2:10). We challenge any Roman Catholic to prove by the writings of the Apostle Paul in the Roman Catholic Bible that a Gentile had to do one good deed or obey any ritual of an organization to be saved or become a member of the one true Bible Church after the RISEN Christ directed the Apostle Paul to make known the Gospel of the Grace of God (Acts 20:24), which gospel Paul did NOT receive from the Apostle Peter, but by direct revelation from the RISEN Christ in heaven. (Galatians 1:9-12). Less than two months after the resurrection of the LORD Jesus Christ, Peter and the other Eleven apostles, and more than one hundred other disciples of the Savior were in Jerusalem waiting for the descent and outpouring of the Holy Spirit in obedience to Luke 24:49. Among the one hundred and twenty was Mary, the mother of the LORD Jesus. (Acts 1:13-15). In Acts 1:14 we have the last mention in the Roman Catholic Bible of Mary. There is no Bible record of her death or when she became a member of the Body of 1 Corinthians 12:13, or that she is now more than a disembodied spirit in heaven, awaiting the resurrection of the saints when the blessed hope of 1 Thessalonians 4:13-18 or Titus 2:13 takes place. There is not one single statement in the Roman Catholic Bible to support their teaching that Mary in a glorified body is an intercessor in heaven or that any member of the Body of Christ, the Age of Grace Church, should pray to her or through her. The Bible clearly teaches that “THERE IS ONE MEDIATOR BETWEEN GOD AND MEN, THE MAN CHRIST JESUS” (1 Timothy 2:4-6); that if Christ were on earth He would not be a priest (Hebrews 8:4), because our LORD Jesus Christ came from the Tribe of Judah, and God’s priests on earth came from the Tribe of Levi. (Hebrews 7:14). God’s death judgment is pronounced upon any not of the tribe of Levi who usurp the office of priest. (Numbers 18:7). In this connection God’s word, spoken by the LORD Jesus, and recorded in the Roman Catholic Bible is very, very plain, “call NO man on earth your father.” (Matthew 23:9). The context and all of the Scriptures reveal that this command of the LORD applies definitely to Roman Catholic priests, including archbishops, cardinals and the pope. We challenge the Roman Catholics to prove by the Roman Catholic Bible that there were any cardinals or popes in the Bible Church mentioned in the Writings of the Apostles. Peter called Mark his son (1 Peter 5:13), as Paul called Timothy his son (1 Timothy 1:2). When a believing sinner is saved under the preaching of some servant of the LORD, the saved one is referred to as the preacher’s spiritual son. We note in the Roman Catholic Bible, in the very same chapter where Peter calls Mark his son, that Peter called himself an elder (the Greek word is not ‘priest’) and he instructed younger and elder to be subject one to another (1 Peter 5:5), just as James wrote, “confess your sins one to another” (James 5:16); NOT to those who claim to be a special order of priests. The function of a priest is to present man to God: the function of a preacher is to present God (in The LORD Jesus Christ) to man. Every member of the Body of Christ is instructed to intercede for every other member, but through the one Priest in heaven, the LORD Jesus Christ. (Ephesians 6:18; Hebrews 7:25; Hebrews 8:1 and Hebrews 6:20). The priestly work of the LORD Jesus Christ is recorded in the Roman Catholic Bible in the seventeenth chapter of John’s Gospel. Roman Catholics should read Christ’s words to Mary in John 2:4 and then Mary’s word for them to obey Christ in John 2:5. 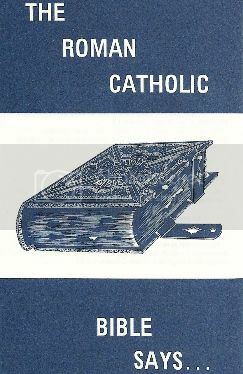 The Roman Catholic Bible does not teach that the Church is the door to Christ, as the Roman Catholics Hierarchy teach, but that the LORD Jesus Christ is the door to the Church; that the very moment the sinner receives Christ as his own individual, personal Savior, meeting God at Calvary, he becomes a member of the Body of Christ, is immediately identified with Christ in His third baptism, (his death on the cross (Luke 12:50), is buried with Him, is raised to walk in newness of life, (Romans 6:3-6), is seated with Him in the Heavenlies (Ephesians 2:6), there blessed with all spiritual blessings (Ephesians 1:3), is then and there joined to Christ and to every member of His Church (Body) in an inseparable, unbreakable, and eternal union and is complete in Christ (Colossians 2:10) (Romans 12:3-5). All of these glorious and blessed truths are taught in the Roman Catholic Bible, and that Bible also teaches that a person must receive the Holy Spirit before he can understand or with assurance claim these blessed experiences. (1 Corinthians 2:14). 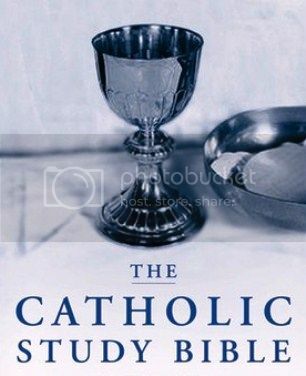 This 7 part series of messages, "What Does the Roman Catholic Bible Teach About Roman Catholicism", should enable all of you to REFUTE the claim by Roman Catholics that God’s program for this Age and Dispensation, with their visible head or vicar of Christ, their college of cardinals, and their order of high and low priests, is being carried on by the Roman Catholic Church, and that their Church was the very first New Testament Church. Every Bible Christian believes in the virgin birth and the eternal Deity of the LORD Jesus Christ, in Whom dwelleth all the fulness of the Godhead bodily, (Colossians 2:9); but no Christian, who is a spiritual, intelligent student of the Bible, believes that God performed a miracle to make the Virgin Mary immaculate or sinless to give birth to the sinless Christ or that she remained a virgin after Christ was born. That’s beyond ridiculous. Mary was conceived in sin and shapen in iniquity, just like you or I before becoming a member of the Body of Christ, and had to receive Christ at Calvary for her redemption and soul cleansing. The Romans Catholic religious teaching concerning Mary, whether called superstition or fiction, is surely, and absolutely, contrary to the plain teaching IN the Roman Catholic Bible. All that the Roman Catholic Church teaches that is CONTRARY to the doctrines taught by intelligent, spiritual, Dispensation of Grace obedient Christians, (Ephesians 3:9), is contrary to the plain teaching in the Roman Catholic Bible. The Roman Catholic Bible is the best answer to the false doctrines taught by the Roman Catholic Church Organization. First the Question: The Apostle Peter had absolutely NO apostolic authority over the Apostle Paul. True or False? Question: There is no Bible proof that the Apostle Peter was in Rome to establish a Church, or for any other purpose. True or False? It is most interesting to compare the commission of the LORD Jesus Christ on earth to Peter and the other Eleven Apostles, recorded in Matthew 10:5-10, especially the command, “Go not into the way of the Gentiles”, with the statement of Peter some twenty years later, recorded in Acts 15:7, “Peter rose up, and said unto them, men and brethren, ye know how that a good while ago God made choice among us, that the Gentiles BY MY MOUTH, should hear the word of the gospel and believe.” When Twelve apostles stood up in Jerusalem on the day of Pentecost it was by the Apostle Peter’s mouth that the LORD’s message was given to Jews, devout men from every nation under heaven. (Acts 2:5 and Acts 2:14). Some to whom Peter spoke the LORD’s message that day were from ROME. (Acts 2:10). Some from Rome believed, and were in Christ before Saul of Tarsus (The Apostle Paul) was converted near Damascus, as Paul tells us in Romans 16:7. Some mentioned in Romans 16 were saved elsewhere. So there were perhaps some saints, and therefore an assembly, in Rome even before Paul was converted. But there was a Church in Jerusalem before there was one in Rome. But the fact we would here emphasize is, that Peter was the LORD’s spokesman for the TWELVE APOSTLES in using the KINGDOM KEYS (Matthew 16:16-19) beginning on the day of Pentecost for the Jews, and about seven or eight years later when “PETER OPENED HIS MOUTH” (Acts 10:34) and began his sermon to the household of Cornelius, the Gentile. From the day Christ gave His command to Peter, in Matthew 10:5-10, “go not in the way of the Gentiles”, until he received the housetop vision, authorizing him to preach to Cornelius (Acts 10:20) about ten years later, the Apostle Peter rigidly obeyed the LORD’s command, saying ten years later that it was not lawful for him to preach to a Gentile. (Acts 10:28). When Peter did preach to Cornelius he was rather severely rebuked by his fellow‑apostles and others for opening his mouth to preach to Gentiles. (Acts 11:1-5). Can any Roman Catholic prove by the Book of Acts, in the Roman Catholic Bible, that the Apostle Peter or any of the other Eleven Apostles ever left the land of the Jews to preach to Gentiles? By the Book of Acts? The Apostle Peter sent a greeting from Babylon, (and yes, it was the actual Babylon) in 1 Peter 5:13, but he never sent a greeting to Rome or from Rome, so far as there is any Bible record. There is no Bible proof that Peter was in Rome to establish a Church or for any other purpose. The Apostle Peter had an opportunity to preach to a Gentile while Christ was on earth, as we may learn in the Roman Catholic Bible by reading Matthew 15:21-27. But obeying the command of Christ in Matthew 10:5, instead of trying to get that poor, needy Gentile saved, he and the other apostles said, “SEND HER AWAY.” (Matthew 15:23). About eight years later he obeyed the ‘sheet’ vision and preached to Cornelius and his loved ones. Then several years later he agreed with Paul that he, Peter, would go to the Jews with the gospel and turn over to Paul the task of evangelizing the Gentiles. (Galatians 2:19). Surely we must often wonder if the Roman Catholic clergy and laity have EVER EVEN READ Galatians 2 concerning Paul’s visit with the men who were apostles before him, including Peter. Not one of these TWELVE apostles was responsible for the Apostle Paul’s conversion, so far as there is any record. Paul did not work under their authority when he was separated by the Holy Spirit to become the Apostle of the Gentiles. (Acts 13:2; Galatians 1:15-16) (Romans 11:13). The Apostle Paul received his authority and his Grace message from The RISEN Christ by direct revelation, and not from the TWELVE by communication. (Galatians 1:9-13). More than fifteen years after Peter preached to Jews on the day of Pentecost he still made his headquarters at Jerusalem (Acts 8:1; Acts 15:1-7; Galatians 2:1-11). Peter was filled with the Holy Spirit and was in the perfect will of the LORD when he was using the keys of the kingdom of heaven and so he was in the will of God when he remained in Jerusalem. (Matthew 10:23). Now this most interesting and significant question, how was it possible for Peter to “disciple all nations”, in obedience to Matthew 28:19-20, while remaining in Jerusalem or by agreeing to disciple Jews by going to them with the Gospel as recorded in Galatians 2:9? Is it not also significant that Peter addressed his FIRST EPISTLE to the scattered STRANGERS and that ‘STRANGERS’ correctly translated should read ‘DISPERSION’, the Jews to whom other Jews referred in John 7:35? Hear this fact, which to Roman Catholics should be astounding, considering the prominence they have given the Apostle Peter in the Church or Body of Christ. In all of the twenty seven Books of the Catholic Bible, called the New Testament Scriptures, no Catholic clergyman can find MENTIONED BY NAME one Gentile who accepted Christ or Christianity under the preaching of Peter other than the household of Cornelius. We say ‘mentioned by name’. Barnabas, Silas, Mark, Barnabas and other disciples who went out from Jerusalem were Jews. Roman Catholics do not like to be challenged concerning their ‘PURGATORY’ man made theory, for the same reason that certain men had the Apostle Paul arrested at Philippi, “when her masters saw that the hope of their gains was gone, they caught Paul and Silas” (Acts 16:19). PURGATORY, with the Roman Catholics, is certainly one big ‘hope of their gains’; but is wholly without Scriptural support. Certainly Luke 12:47-48 and 1 Corinthians 3:15, ‘many stripes’ and ‘few stripes’ and ‘saved so as by fire’ in no way teach the PURGATORY of the Roman Catholic Organization, for a Christian is not appointed unto wrath, but to obtain salvation by our LORD Jesus Christ (2 Thessalonians 5:9), Yes, the Christian is delivered from the wrath to come (1 Thessalonians 1:10), (John 3:36). The Roman Catholics’ PURGATORY, being purged in fire for a long period, is WRATH TO COME. The believer shall not come into that judgment. (John 5:24). The Bible does not guarantee eternal life to Catholics or everlasting perdition to Non-Catholics, but it absolutely guarantees everlasting life and eternal glory to every believer saved by the infinite, matchless, abounding Grace of the God of all Grace, and eternal CONSCIOUS perdition to every sinner who refuses or fails to meet God by Faith at Calvary, where the LORD Jesus Christ ONCE for all put away sin by the sacrifice of Himself and where God perfects, FOREVER, all who are cleansed by the precious shed blood of the Lamb of God, Who beareth away the sin of the world. Read 1 Timothy 2:4; Hebrews 9:26; 1 Peter 1:18-21; Romans 5:1; John 1:29, and Hebrews 10:14. God’s Word is clear, “THERE REMAINETH NO MORE SACRIFICE FOR SINS”. (Hebrews 10:26 and Hebrews 10:12). What does it mean to be justified FREELY by God’s Grace through the redemption that is in Christ Jesus and His ONCE for all shed blood? (Roman 3:24-26)? The Greek word translated ‘FREELY’ is ‘DORIAN’, which word is translated in John 15: ‘WITHOUT A CAUSE’. Whether you are a Roman Catholic, a so called Protestant, a church member sinner, or some other kind of a sinner, believe that eternal life is God’s FREE GIFT through Jesus Christ. The Roman Catholic Bible says so in Romans 6:23; John 3:36; John 5:24; John 6:47. 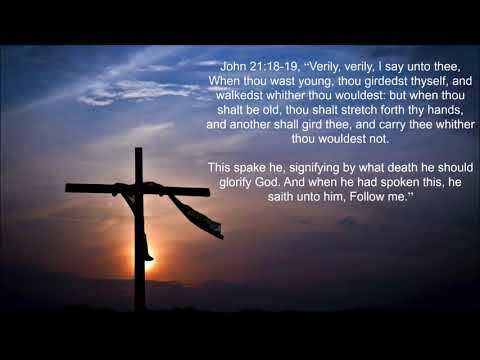 No religious dignitaries or potentates were needed to canonize the thief who died on the cross, after his death, to get him out of PURGATORY, for the LORD said, “TODAY, shalt thou be with me in PARADISE” (Luke 23:43) For every member of the Body (Church) of Christ, death means, absent from the body and present with the LORD (2 Cor. 5:8), it means to depart to be with Christ. (Philippians 1:23). Perhaps those who called the PURGATORY teaching a religious money making racket have been seemingly ungracious. The Apostle Peter spoke of religious leaders who made merchandise of people. (2 Peter 2:3). The teaching of PURGATORY is worse than that. To the first Church of Rome the Apostle Paul wrote his Epistle, and in the sixteenth chapter he sent greetings to about twenty‑five saints by name and then added, “to all the saints that are with them.” (Romans 16:15). Many of the saints that Paul addressed in his different Epistles did not walk as becometh saints (compare Ephesians 5:3 with 1 Corinthians 3:3), SO, they were not saints because they walked as saints or behaved to please the LORD spiritually. The Corinthians became saints in the manner set forth in 1 Corinthians 6:11. The Ephesians became saints in the manner recorded in Ephesians 2:8-10. Sinners become saints by believing, not by behaving. They SHOULD behave as becometh saints AFTER they become saints BY believing, BY receiving the Grace of God, which they should not receive in vain. (2 Cor. 6:1).